The Riddell SpeedFlex Adult Football Helmet has arrived and has set the standard for helmet technology. 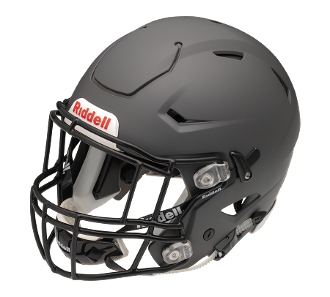 Designed with breakthrough advancements in protective elements, the Adult Speed Flex Helmet exceeds the expected safety measures demanded by top notch football players and parents. Featuring technological advancements specifically created to absorb all of the hits experienced on the gridiron, Riddell has made yet another advancement in the football helmet industry. Inside the helmet, the speed flex consists of a composite energy management system that is designed to keep the interior padding in place and reduce the sudden movement of the head upon impact. A detachable moisture resistant liner provides maximum comfort and sweat absorption. The ratchet loc system in the chin strap along with the flex liner and true curve liner system allow for a custom fit every time you put your Speedflex helmet on regardless of your head shape. Combine the interior technology with the flex system that is engineered in the shell and face mask to reduce the impact force transfer to the player. Finally, the occipital lock system in the rear of the helmet cradles the occipital lobe in the back of the head improving the security and fit. The elite level of style and protection makes the Riddell SpeedFlex football helmet a revolutionary product in today’s market and a must have for any serious football player! 5 star Virginia Tech Helmet Rating (Best possible rating). Detachable moisture-resistant comfort and fit liner. Total weight of 4.55 lbs including facemask and chinstrap. Side impact force reduced by Patented Side Impact Protection (PISP). A Flexible liner is used in order to increase comfort and stability for all head shapes.